Club Group wholesaler Kardwell Hobbs has brought out a handy all in one mobile phone accessories FSDU. Gainsmore members will benefit from up to 7 weeks of credit! So much of what we sell has been replaced by the march of technology, so here is an opportunity to put some margin back in your pocket. 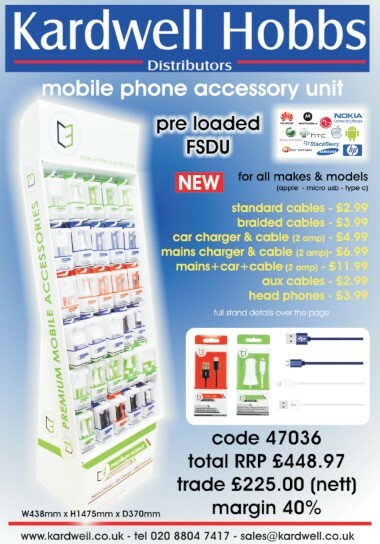 The FSDU olds a comprehensive range of mobile phone accessories with a tidy POR of 40%. The range includes cables chargers for all the main types of phones (Apple and Android). Click on the image to see the full contents and pricing or follow the link below to get Kardwell Hobbs in touch with you so you can take advantage of this and the many other deals they offer!